Dr. Luns C. Richardson presiding over 2017 Morris College graduation. 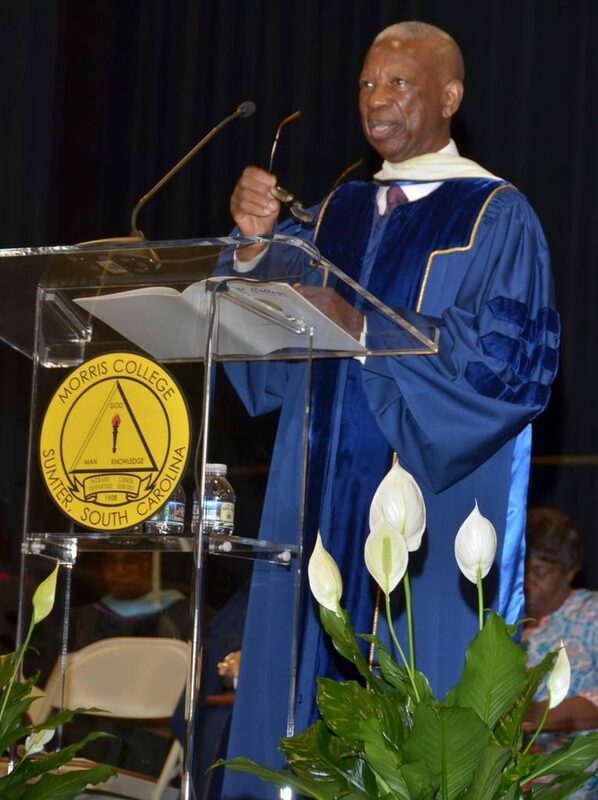 COLUMBIA, SC (guest column courtesy thestate.com) — Luns C. Richardson presided over his last commencement as president of Sumter’s Morris College in May, ending 43 years of service. His tenure as one of the longest-serving presidents in country and his many accomplishments place him among the most prolific educators in our nation’s history. His legacy could be defined by his reputation as a hands-on president. For example, Dr. Richardson insisted on interviewing every job applicant who visited the campus. During those interviews, he gave each candidate a history of the college, shared a personal story or two and tested the candidate’s knowledge of the college’s website. Afterward, he would wish the candidate the best and carry on with his day. If the applicant was hired, it was not uncommon for Dr. Richardson to extend his personal welcome. Or perhaps Dr. Richardson’s legacy will be linked to the college’s physical plant. During Morris College’s centennial celebration in 2008, the institution was touted as a 100-year-old college on a 25-year-old campus because most of the buildings had been renovated or newly constructed within the previous quarter century. All of this construction took place under Dr. Richardson’s leadership. A physical plant means very little without accreditation and financial security. So Dr. Richardson’s legacy could be connected to Morris College’s solvency. Many colleges have failed to meet accreditation or become defunct due to financial inadequacies, but Dr. Richardson pulled the college from near bankruptcy in the 1970s, and the college operated in the black throughout the rest of his tenure. Morris College also acquired accreditation under his leadership. Another measure of Dr. Richardson’s legacy could be found in the faculty and staff, which is one of the most caring and committed groups of educators I have worked with. You will hear glowing praises from students, who attribute their success to these individuals. Faculty and staff take a personal interest in the students’ academic and personal development, at least in part because they stay: In Dr. Richardson’s view, the low attrition rate of his faculty and staff contribute to student satisfaction and the overall stability of the college. But the greatest legacy a president can leave is students. Generations of students credit Morris College with giving them a chance at success, which I believe ties in to Dr. Richardson’s students-first philosophy. He walked the campus regularly, ate in the student dining hall, attended student assemblies and rolled in the suitcase of the first student who arrived each year during freshman orientation. Even personal financial gifts to Dr. Richardson were passed on to student scholarships. I recall one student who moved to Sumter to take a job, but when his job situation fell through, he became homeless. While searching for a place to live, he literally stumbled upon Morris College and thought he would apply — not to get an education but to have a place to live. Five years later, this student finished his program with honors and received a commodation for the highest capstone presentation. If you interview any graduating class, you will find numerous stories just like this. Though some students complain about the challenges they face during matriculation, you can rarely find alumni who have anything negative to say about the college. After retirement, I hope Dr. Richardson will find time to write his memoirs. Since he will go down in history as one of the deans of college presidents, I am sure his book will be required reading for any aspiring educator.